Don’t get me wrong, I’m of the Star Wars Generation.... I was 12 (the perfect age) when I saw the first movie (or the fourth, again, whatever) in the summer of ‘77 and I did love it. I had “Star Wars” action figures and comic books and posters and soundtracks and T-shirts. I waited in line for hours on opening day to see “The Empire Strikes Back ” and “Return of the Jedi .” Friends and I even went so far as to make our own parodic tape featuring the characters meeting the crew of the Starship Enterprise (I played Dr. McCoy, Yoda and Darth Vader). “Star Wars” fit right into my geeky lifestyle. And yet, as time wore on, while I held on to many of the trappings of my youth (comic books, punk rock and stuff that glows in the dark still fit into my life), I found that I completely lost any affection for “Star Wars.” I got rid of all the memorabilia, I didn’t see the original movies in their re-releases, I never pined for the DVD, I only saw “The Phantom Menace ” and “Attack of the Clones ” on video (two thumbs way down). I’ll eventually see Hayden Christensen slap on the ill-fitting helmet, breaking poor Natalie Portman’s heart and disappointing Ewan McGregor and the voice of Frank Oz, but probably not until it comes to video or cable. Heck, I already know how it ends. Nostalgia is a powerful force (no pun intended), but it’s usually misleading. Time clouds our judgment and pieces of pop culture from our youth rarely hold up upon adult revisitation. In the era of a thousand cable channels, DVD box sets and digital downloading, most things we remember from our childhoods are available for us again. But caveat emptor: We may have warm memories of “Super Friends ,” but to watch it in 2005 on DVD (as I did, foolishly) is to realize that the show was just kiddie crap, hacked out by workhorse animators who weren’t concerned with crafting lasting art. They were just earning a paycheck. I’m not trying to say that “Star Wars” wasn’t made with care, but when I saw it again on video as an adult, it just didn’t hold up for me (and I didn’t even like “Jedi” when I saw it in the theater). I agree with the common opinion that “The Empire Strikes Back” is the best of the lot, but it’s still full of that leaden, awful dialogue spoken by characters that all (Han Solo maybe excepted) have the dimension of a piece of paper. Unlike “Superman,” Peanuts comic strips or KISS, I can’t adapt “Star Wars” to my sensibilities in 2005. 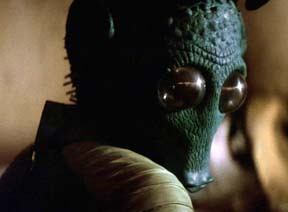 Still, nobody ever accused George Lucas of being original. 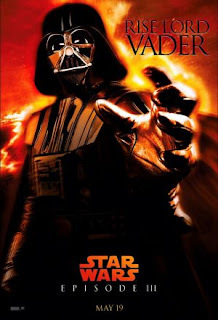 The “Star Wars” saga draws heavily from old cowboy movies (with their clearly defined white and black hatted heroes and villains), Flash Gordon serials, the samurai films of Akira Kurosawa , the works of Joseph Campbell and Jack Kirby’s “New Gods ” comics of the early 1970s, among other sources. While many feel that Lucas’ genius was being able to synthesize all these elements into something bigger than its precedents, I think the truth may be the opposite. Lucas distilled all of those influences into the most crowd-pleasing, synapse-snapping, easy to digest movie of all time, something as palatable as astronaut ice cream, but just as lacking in nutrients. There’s nothing wrong with junk food in moderation, but few people ascribe it gourmet status. “Star Wars” fans don’t seem to be satisfied with the movie being simply the most POPULAR film ever made; They insist that it’s also the BEST (one IMDB posting declares it a “disgrace” the film only rates #16 on their list of all time greatest films). But to me, it’s just okay. No doubt, by now, many of you are ready to challenge me to a light saber duel to the death, and that’s fine. But bear with me here, I’m not a hater. Honest. I’m just fascinated by a devotion that is as undying, absolute and forgiving as that of those people screaming every day outside the Michael Jackson trial. I’ll admit that my feelings for the original series were further damaged by the absolutely atrocious Episodes I and II. In the opinion that those films were sterile, overdone CGI-fests with little heart, I am far from alone. And yet, somehow, perhaps through Jedi mind tricks, “Star Wars” fanaticism has managed to rise even as the franchise has gotten worse and worse. To top it off, Lucas’ continuing insistence on tinkering with the original films displays a fanboyish obsession with continuity that I find an annoying waste of time. Who really cares that different actors later played Boba Fett or the Emperor? It’s probably only a matter of time before the Muppet Yoda in the original series is replaced with CGI (And don’t get me started on Greedo shooting first). And yet, ironically, these alterations don’t seem to bother fans who treat the films with an almost religious reverence. Still, I understand why even people who thought Episodes I and II sucked would still wanna see III: Anakin becomes Darth Vader. I get it. It’s almost as if the point of the insufferable Jar Jar Binks was just to make the payoff sweeter for fans. But I am amazed at the lack of cynicism regarding “Revenge of the Sith.” Barely anyone seems to be going in with guarded expectations. Even the M&Ms are geeked. Who knows, maybe I’ll break down and go see “Revenge of the Sith” in the theater, and maybe I’ll love it. Maybe it’ll be so good that it’ll force me to reevaluate my feelings about the entire series. Maybe I’ll end up trolling eBay looking to replace my long-gone Boba Fett action figure. But I doubt it. After all, when you string all six movies together, it still ends with a freakin’ teddy bear’s picnic. Yeesh.